1 Remove and discard the hard cores from both the cabbages, then finely shred. Use a vegetable peeler to pare the carrots into thin strips, then shred into long thin strips. Very finely cut the apple into matchsticks. 2. Reserve a little of the parsley and a few pecans and pomegranate seeds to garnish. Put the remaining ingredients in a large bowl, combine and season. 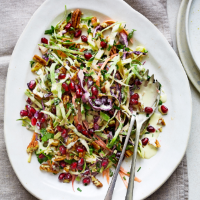 Toss through the cabbage, carrots and apple and serve scattered with the reserved parsley, pecans and pomegranate seeds. The slaw can also be made a few hours ahead and chilled until you’re ready to eat.